Workers in a recent survey cast a vote of confidence for the executives leading their firms. 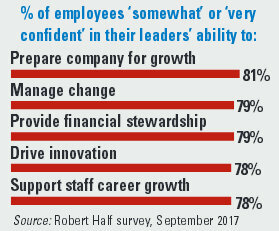 Approximately eight in 10 professionals polled by Robert Half Management Resources feel at least somewhat confident in the ability of senior management to grow the business, provide sound financial stewardship and drive innovation. Similar numbers of respondents believe their organization’s executives support staff members’ growth and manage change effectively. Workers were asked how confident they are in the abilities of their company’s leadership in the following areas.